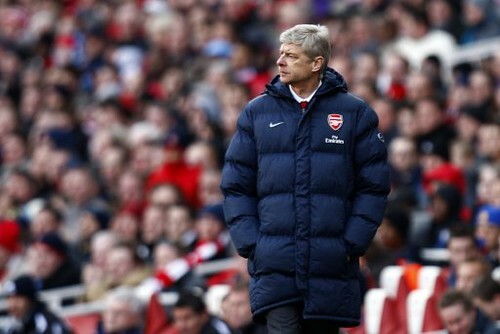 Arsene Wenger , originally uploaded by Ashburton Grove Blog. The main news around this morning is that Arsene Wenger won't be leaving Arsenal any time soon for Real Madrid. He held his weekly press conference yesterday ahead of our match with Hull on Saturday. It's widely believed that Real's coach Manuel Pellegrini will go in the summer and president Florentino Pérez will want to replace him with our manager after splashing out on Ronaldo, Benzema, Kaka and Alonso among others last summer. Wenger however has reaffirmed his commitment to us, which is always good to hear. "I am always going to the end of my contract and I am going until 2011 - there is no way." "It shows in Europe you have no guarantee. £240 million doesn't buy you the Champions League necessarily. "If you can spend it every year you will get there. But it is the first year with Pérez back and you have to give him time. "He only has to invest again next year, so I think they will be a force again." In the Times, chief executive Ivan Gazidis state his belief that Wenger wouldn't resign. can replace a manager like Arsène with a snap of your fingers." The same paper also confirm that contract negotiations with William Gallas' advisers took place on Thursday, but Wenger refused to confirm if he is willing to break the club's rule of giving players over 30 only a one-year contract. The Daily Mail are running a story about Lukasz Fabianski. They asked Arsene whether the it would have been a personal disaster for Fabianski had the Gunners not won against Porto on Tuesday. “Yes, it would have had long-term mental consequences for him had we gone out. “He could have felt, 'Ah, they blame me,' even if it wasn't true. 'So I think the result on Tuesday has helped him to recover. Former Arsenal player Jermaine Pennant could be coming back to the Premier League, with Stoke rumoured to be interested in signing him, according to the Daily Mirror. And the Daily Mirror also report David Seaman was divorced by his second wife yesterday over his affair with Dancing on Ice star Frankie Poultney.